My Grandmother loves the Japanese Chin breed and owns 4. One of her girls had puppys and Anny came into our life. She is so much fun! My lil girl loves her! We are unsure tho if Anny knows she is a dog. You see, she carries a binky from time to time. Rides in the stroller with my lil one and stands next to her while food is being prepared waiting for her plate. 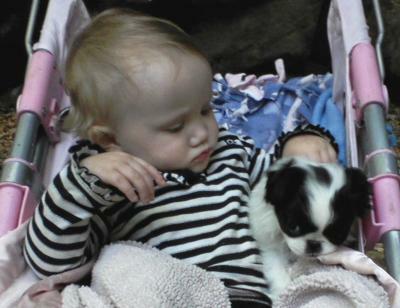 Yep we are pretty sure she thinks shes the baby sister!